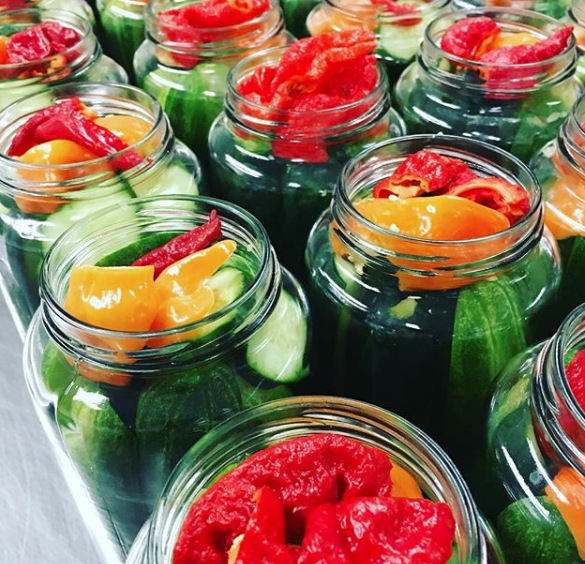 Epic Pickles are a local favorite, and for good reason! Rob Seufert, founder and pickler-extraordinaire, is meticulous in his ingredient sourcing and his hand-crafted process. Epic starts with the freshest ingredients they can find and sources locally whenever possible. They cut, spice, and jar everything by hand, and it pays off with pickles that are full of flavor and crunch. It also pays off in the form or awards; Epic has won several, including “Best Dill Pickle” at the International Pickle Festival in Rosendale, NY. And, mind you, pickles aren’t just cucumbers. Epic turns all kinds of veggies — carrots, green beans, asparagus, okra, and cauliflower — into delicious salty, tart, sometimes sweet and/or spicy snacks. They’re great for appetizers, charcuterie boards, and (one of our favorite uses) Bloody Mary garnishes. Our own fridge usually has a jar of Spicy pickles in it for those I’m-walking-past-the-fridge-maybe-I-want-a-snack moments, and to round out a quick lunch. We also carry their Epicante salsa, which is great to keep on-hand for parties or unexpected guests. If you’re in the market for a new (healthy) vice, Epic is a great place to start. Just ask any one of the many customers we see nearly every week, coming to feed their self-described pickle addiction.